I came home from the Ushaw conference last Thursday and I am still recovering. 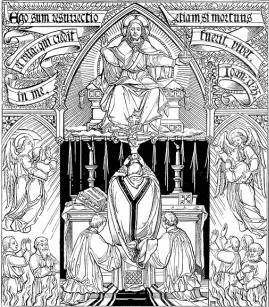 Because most of us priests there were celebrating the Extraordinary Rite we had to be up early to say Mass. I was booked for 6.30 am and so (because everything is moving slower for me these days) I had to be out of bed by 5.15 at the latest. I am still thinking about some things I heard and saw on the conference, and there is one area in particular that I find fascinating because it links up with the Orthodox liturgy and with the Church of antiquity. This is what I could call "veiling". I am thinking of the Great Entrance in the Orthodox Liturgy, the use of the humeral veil in the 1962 Solemn High Mass and the tradition we have (or had) in the Catholic Church of veiling tabernacles and covering the sacred vessels before and after Mass. There is something here to examine and think about because it speaks of mystery in relation to the Eucharist. many Catholics, and some Christians of other denominations seem to have an instinct for the sacred. This leads to comments about the vernacular Ordinary Rite lacking "mystery" and to the adoption - especially in non-Catholic communities-of the kind of ritual that would have been unthinkable a hundred years ago. I think the effective veiling of the paten by the corporal at low Mass is a truly sublime act. If only more priests were truly aware of the significance of these rubrics and actions! As someone who has a deep interest on ecumenism with the Orthodox, what would you say of those who believe that the liturgical reform of Vatican II has been a barrier - that we have moved even further away from whatever we had in common with the Orthodox.